“The sacrifice of global interests to domestic politics and to bureaucratic self-interest is nothing new, and it is certainly not a uniquely American problem. Still, we have not seen such systematic distortion of intelligence, such systematic manipulation of American opinion, since the war in Vietnam”. Many good points are made, some of which I believe we in Britain ought to be asking ourselves. Why, Mr Blair, have you been unable to convince your fellow MPs? Why has America and the UK failed to convince a great deal of the rest of the world that this is a proper course of action? While I have no doubt that there is much that can not be made public, the fact that we have failed to convince foreign leaders of the rightness of our approach is, to me, the most serious cause for concern. If we have to go to war, I would like to believe that it is being done with the backing of the world. The current talk of re-building the Middle East seems to be the worst kind of message coming from the West, and especially the US. Who gave them (or, indeed, us) the right? Although I don’t like it, I am not anti-war. But war only if appropriate and only when all other reasonable actions have been taken. Then, with the support of the rest (or at least a majority) of the world, I would concede war is necessary. Until it does, we have to be very careful indeed. As Mr Kiesling says, it all smells suspiciously like something in Vietnam. And we know how that ended up, don’t we? This entry was posted in On The Web on February 28, 2003 by Jon. This from Jason Kottke is spot on. ‘Nuff said. This entry was posted in On The Web on February 26, 2003 by Jon. Great news today. Stupid White Men by Michael Moore (which admittedly is still sitting on my bookshelf only part-read) has just won an award at the British Book Awards [BBC News]. Although I haven�t read all of it, what I have read is superb and, no doubt I am going to get round to it very soon. It was shelved by its US publishers after the events of September 11 2001 but eventually published thanks to a campaign started by US librarians. 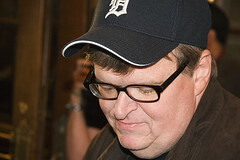 The reason I am happy is that I am a converted Michael Moore fan. Although I was a fan of Roger and Me and TV Nation, it was Bowling for Columbine that made me realise how important it is to have other voices in the media. Probably the same reason I enjoy blogsphere � I believe it is important that other voices are heard. Well done to Michael Moore! 2008: Is Echo Beach In The Right Place? This entry was posted in Books on February 25, 2003 by Jon. According to a story on BBC News today, US online sales hit record levels. US consumers might have stayed out of the shopping malls and department stores in the run-up to Christmas, but they spent plenty of time buying online. Department of Commerce figures show online sales grew by 28% in the three months to December compared to the same three-month period a year ago. American consumers spent $14.3bn (£9bn) online in the final three months of 2002, accounting for 1.6% of all retail sales – the highest level since e-commerce statistics were first compiled in 1999. Survey after survey seems to be suggesting that online retailing is on the up. Admittedly, theres a long way to go but the signs are encouraging. Shopping is the pastime for the new century and it appears that (American) consumers are moving more of it online. Is it the quick rush that you get from hitting that checkout button? Certainly, I find myself doing more and more shopping online  I find it so much easier. A wander around the shops is, for me, now more of a form of entertainment or leisure pursuit. To actually buy things I will sit in front of a screen. However, I am having trouble getting used to the idea of online grocery shopping. Supermarkets have a strange appeal for me. Perhaps its the endless aisles to explore or the interesting new products on the shelves (really). I am not sure but I am pretty certain that my trolley-wielding days are numbered. This entry was posted in On The Web on February 24, 2003 by Jon. I have never been the biggest fan of Jack Nicholson’s movies but I am not sure why. It’s not his acting that I have a problem so it must be his movies. Well, About Schmidt is a film I thoroughly enjoyed. Jack plays Warren R. Schmidt who has just retired from his job and doesn’t quite know what to do with his life nor why it has lead him to this point. He sponsors a African child as a way of settling his conscience and his letters are very telling. When his wife dies, Schmidt sets of across America. His journey is partly to find the places of his childhood but mainly to sabotage his daughter’s wedding who he things should be achieving more. If you have lost your way and can’t quite see why you are stuck all day in a dead-end job then this is a movie for you. It’s not action-packed and lacks a thrilling ending but it is about real people and real human pains and Jack Nicholson’s performance is wonderful – capturing his sense of loss (over his job rather than his wife) superbly. This entry was posted in Films (aka Movies) on February 23, 2003 by Jon. If it wasn’t true, nobody would believe it. He scammed over $2 million dollars before he reached the age of 21 while coning airlines and banks out of money and seats. He’s played as a stylish, handsome dude in a film that’s almost as cool to watch as Ocean’s Eleven. He was Frank Abagnale Jr. and he’s played by brilliantly by Leonardo DiCaprio in the superb movie, Catch Me If You Can. It’s not what you would expect as it can be quite dark and it is hard to believe that FBI Special Agent Carl Hanratty (Tom Hanks) becomes so obsessed with chasing him. Be warned, the movie is longer than you would expect but there are some good performances (Christopher Walken stands out) and so it’s an ideal movie to pass a Saturday night. I came out of The Hours somewhat stunned. This is a remarkable film and I thoroughly enjoyed it. Nicole Kidman, Meryl Streep and Julianne Moore are all superb and utterly believable. The link between the three (Kidman as Virginia Woolf, Moore as a 1950s depressed housewife and Streep as a confident modern woman) are seemingly only linked by a book – Mrs Dalloway. The lives of the three are crumbling in various ways and this conveyed well on screen. Kidman  hardly recognisable thanks to great make-up  is superb and going slowly mad in 1920s Richmond. Moores character appears to have feelings of worthlessness while Streep is coping with modern day New York while her relationship seems to be going nowhere and a good friends suffers with AIDS. This isnt a happy film. Many of the scenarios are quite sad but it isnt really a depressing film either. Its engrossing and engaging and even the supporting characters are played brilliantly. This entry was posted in Films (aka Movies) on February 21, 2003 by Jon. I have long used my trusty old Palm Vx to update websites. Usually, however, it means syncing the Palm and uploading content at a later date (see this for example). Now I can genuinely do it on the road. Is mobile weblogging the future?? This entry was posted in On The Web on February 21, 2003 by Jon. oh! all kinds of reasons, but fundamentally it is about loneliness. Is it? Maybe it is. Who knows? I honestly think Kenneth Williams was unique. He certainly seemed to hate much about himself and didnt have a great deal of time for a lot of other people. Sadly, the Diaries reputation precedes them and I expected more of the bitchiness that he is  supposedly  famed for. Despite that, there is plenty of Kenneths acid tongue in this book. His barbs are aimed squarely at his fans, his colleagues and the shows he felt obliged to work in. Some of the most intriguing insights are those that relate to the Carry On film series. Before Carry On made him famous, he was a well-respected stage actor. The Carry On films made him legendary (and wealthy) but he often felt they were beneath him. it is extraordinary that Im so liked because Im invariably rude & tetchy and that sums up much of the book. You get a sense of love for the theatre, plays, and poetry and even for some of the work. However he is also offensive to many and seemed to have few good words for much of British Theatre. Much of the hate is due to an inner turmoil over the lack of companionship in his life (Never to speak of my love for a man) and some from the frustrations of his nature. Obsessed by noise and cleanliness the very act of living seems painful  and in the end his illness and genuine pain appear to get too much for him. The diaries are very well written and Davies editing not intrusive. Williams certainly didnt appear to edit himself and the result is a frank and articulate book. Words seem to flow easily which is, perhaps, not surprising for a man who made a living in the final years of his life from his large collection of humorous anecdotes. Spanning over forty years its hard to keep track of the players in Kenneths life and at 800 pages its not a light read. Nevertheless, the diaries are a vivid, malicious and (at times) very funny read into the world of a man who, in his day, was considered outrageous. This entry was posted in Books on February 20, 2003 by Jon. The BBC has redesigned its news website. To me, it is one of the best news sites around and all done without any advertising. I am happy for my licence fee to be used for digital content – I believe that it certainly is part of what the BBC is all about. What surpises me, however, is how much talk such re-designs generate. The news is still there and we’ll all get used to the new layout. Personally, I like the wider screen as my monitors all have great screen resolutions which seemed to make the old site shout a little bit. I am sure there are some things that are not great about it but overall I like it. I’ve also noticed that the BBC seems to leave the older news in previous styles (remember this look?) which is something I wholeheartedly approve of – a proper archive of the way the web looked. I wish I’d been doing that with my sites over the years. I am sure there is a whole post on archiving the web – but perhaps not tonight. This entry was posted in On The Web on February 19, 2003 by Jon.